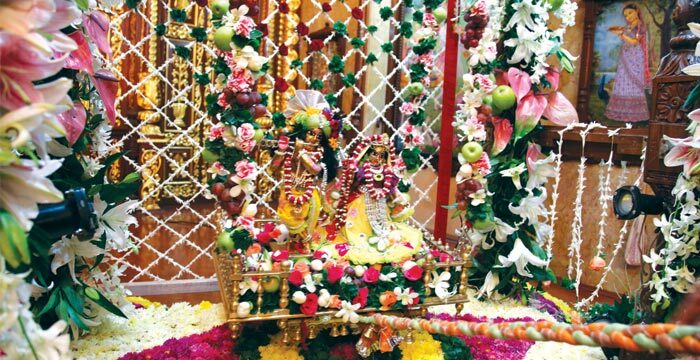 “When we think of Jhulan Yatra, Radha Krishna sit on the beautiful swing, which is so wonderfully decorated by their confidential associates, decorated in such a way that all of the wealth and opulence of the world can never compare.” – Radhanath Swami. Today we are celebrating the beautiful festival of Shri Jhulan Yatra of Radha Govinda. It takes place during the rainy season, a season that is so beautiful in Vrindavan. The scriptures explain how beautiful, beautiful blackish clouds form in the sky and in the spiritual realm of Vrindavan these clouds very, very much resemble the complexion of Shri Krishna. They appear to be reflecting the beauty of Shri Krishna’s eternal form and wherever you look, you see the beauty of Shyamsundar, through these most merciful and beautiful manifestation of clouds. This is the loving relationship between the Lord and his devotees: Krishna wants to give all credit to his devotees and his devotees want to give credits to the clouds. Understand: in Vrindavan, every cloud is a pure unalloyed devotee who has come just to manifest something wonderful as an offering to Krishna. This is the nature of Vrindavan, the spiritual world. Shrila Prabodhananda Sarasvati Thakura, in one prayer he explains, “I do not care if there is no Krishna. I do not care if there is no Radharani. I do not care if there is no Sakhis and Manjiris and Gopas and Gopis. Just one little tiny plant of Vrindavan is so supremely auspicious that, that alone can fulfill all my spiritual desires.” This is Vrindavan! So every cloud, as they are forming, Krishna is Ghanashyam, he gives credit, “I am like a cloud.” But the clouds are glorifying, “We are Shyam. We are just like Krishna in our beautiful complexion.” And Krishna bestows his mercy upon the clouds by his loving glance, and they reciprocate by showering beautiful rains. Not like the rains in Bombay – dirty, acid rains, that makes everything messy and dirty and brings mud into your homes; and everyone is running away; causing floods and sewage pipes to overflood and everything. But in Vrindavan, the rains are so wonderful that they simply refresh everyone and everything. They are so nice that they can go on you – the raindrops – and they refresh you, but if you do not want to be wet, they will not make you wet; this is Vrindavan. If you want to be wet, they will make you wet, but they are simply pleasing, pleasing all of the devotees so that they become more and more in a sweet mood to please Krishna. So during this (rainy) season, everything is so blossoming, blooming and fragrant in all directions, and at that time the devotees of Vrindavan – and Brijawasis especially headed by the most confidential associates of Shri Radharani and Lord Govinda – they arrange under the direction of Brindadevi, beautiful, beautiful Jhulan, or swing for Radha and Krishna to enjoy together upon. And there are unlimited ways in which Radha Govinda enjoy their Jhulan Yatra. Sometimes they make a swing shaped like a lotus flower, where Radha and Krishna sit in the middle and the eight Sakhis and principal Manjiris and everyone sit on the same swing and then Gopis make that go. And sometimes Radha and Krishna sit together on this swing. And sometimes Radharani puts her friends on the swing and pushes it because she wants everyone to enjoy the wonderful loving emotion or devotion of being with Krishna. But generally, when we think of Jhulan Yatra, Radha Krishna sit on the beautiful swing which is so wonderfully decorated by their confidential associates, decorated in such a way that all of the wealth and opulence of the world can never compare. So the swings of Radha and Krishna are decorated with the beautiful flowers and leaves and creepers of Braja, and as they sit together enjoying the company of one another, all of the devotees find supreme satisfaction – in seeing Radha and Krishna enjoying together. That is the ultimate satisfaction of all the pure liberated souls of Vrindavan. They do not want anything for themselves; they only want to somehow or other, in any way possible, be of some assistance to the beautiful pleasurable pastimes enjoyed between and Radha and Krishna. This evening we have seen Radha Govinda on their beautiful swing, and each of us had a chance with our hands to pull the swing and create a wonderful atmosphere for them to enjoy. And other devotees had the fortune of decorating the swing as beautifully as they possibly could, with all their creative abilities – with flowers and feathers of the peacocks and leaves. And others, they cooked wonderful, wonderful Bhoga for Radha and Krishna to enjoy during their swing festival. And other devotees, they come together, and during this whole wonderful pastime, they are singing beautiful Kirtan and dancing to enhance the pleasure of Radha and Krishna. This is our life. In places like London, Nairobi, Moscow, Bosnia, Croatia, South Africa, Durban, China – even the Chinese devotees in Beijing – in these places tonight they are swinging Radha and Krishna on their Jhulan. Hong Kong, Taiwan, Korea, Chicago, New York, Atlanta, Los Angeles, Toronto, Montreal… as we are speaking tonight, throughout the entire world, people are celebrating this wonderful festival. 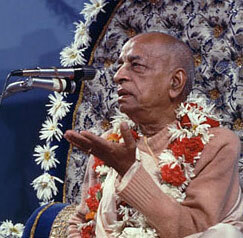 So we can understand what kind of empowered compassion Shrila Prabhupada had to the world. 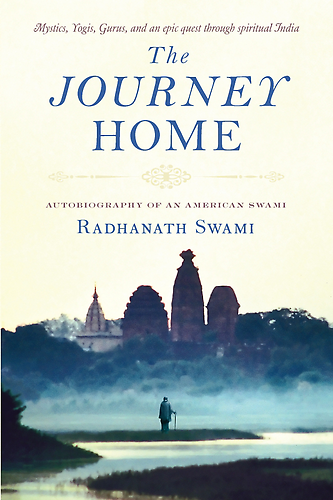 He did not leave Vrindavan in 1965, but he brought Vrindavan to the entire planet. He gave everyone the opportunity to enter the wonderful Leela of Radha Govinda and he taught us the proper way of life by which we can deeply become purified and go back home back to godhead: through attentively chanting the Mahamantra every day, by following the four regulative principles, and by developing the mood of being the sincere and humble servant of the Lord. You see, there is a beautiful painting across from me: Radha and Krishna Jhulan Yatra. Everyone is simply in the mood of servant. No one has the tinge of desire for their own enjoyment; they all simply exist for the enjoyment of Shri Shri Radha Gopinath. So this process which we follow within the International Society for Krishna Consciousness is the authorized process of gradually developing this spiritual attitude – not wanting to enjoy Radha Govinda, but gradually developing such a prideless materially desireless state that our existence is simply – at every moment, for the rest of eternity – being offered for the pleasure of Radha Govinda and their most beloved devotees.